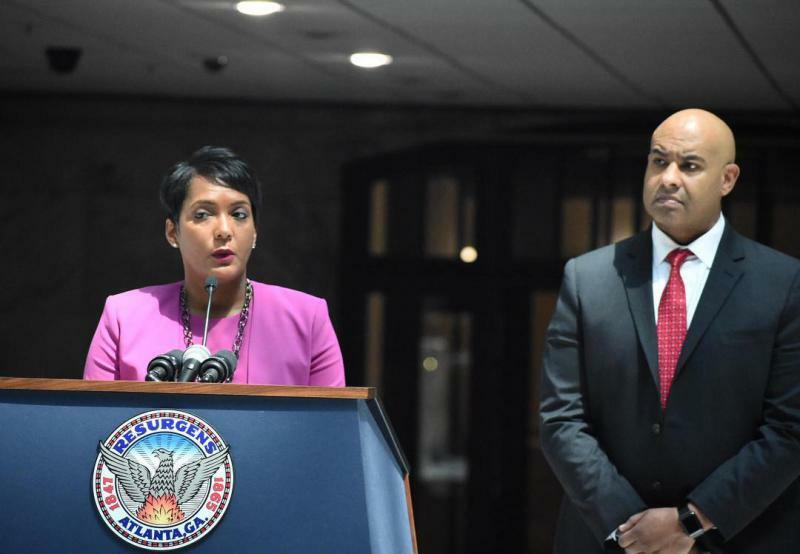 Atlanta Mayor Keisha Lance Bottoms and Chief Operating Officer Richard Cox stand at Atlanta City Hall during a press conference about transparency. 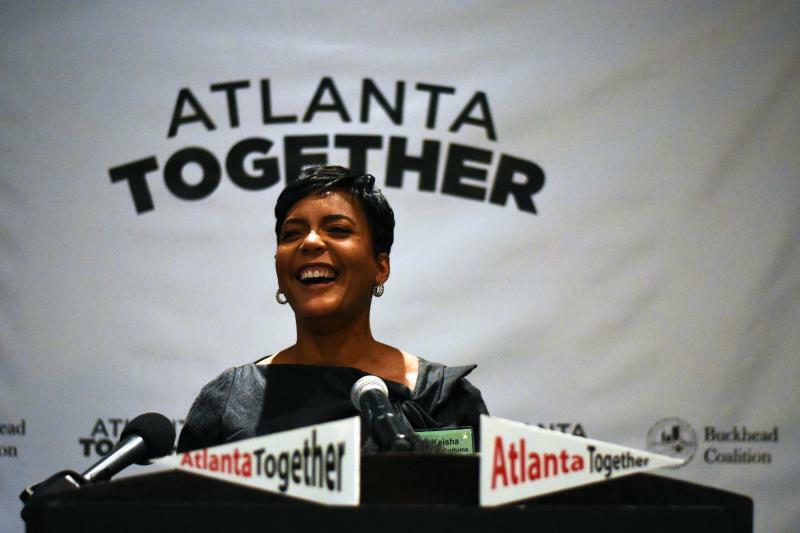 But in front of a City Hall packed with hundreds of concerned employees, Bottoms also faced questions about her cabinet reorganizations, new indictments in a city bribery probe and the lingering effects of a crippling cyberattack. GPB’s Stephen Fowler was at City Hall. He joined me in the studio to talk about the latest news and the bigger picture of the mayor’s statements. GPB's Rickey Bevington talks with reporter Stephen Fowler about a new transparency tool the City of Atlanta will launch, plus the latest on a federal bribery probe and a crippling cyberattack on city computers. RICKEY BEVINGTON: So today's announcement was all about transparency in city government. That can mean a lot of things. What exactly is the city hoping to make more transparent? You're also going to be able to look at spending by city department, how much specific vendors are getting paid…. And it's all searchable, which is great for journalists like us. Now what this means is it's a checkbook. So just like I have a checkbook to see how much money I spend on Chick-fil-A and you have a checkbook to see how much you spend on Starbucks, we can look at the city's checkbook to see what they're spending money on, how they're spending it and who's getting that money. So why now? Well, the mayor pointed out a 2013 study on transparency in city spending. It gave Atlanta an F rating among the 30 largest cities in the U.S.
Chicago scored a 98 on a 100 point scale and Atlanta had a 46. Plus, the main problems with City Hall come from spending and the procurement department and there's little to no transparency there and how things have been done. BEVINGTON: Speaking of transparency, this press conference comes less than a day after news broke that the entire cabinet was asked to resign. What was the mood like at City Hall today? FOWLER: For those of you who haven't been in City Hall, you walk in there's a giant atrium and there's five floors of city offices and buildings. And hundreds of employees were sitting there looking down at the mayor who was able to look up and see all of her employees there. There were a lot of concerned faces in the crowd. Even the mayor herself seemed concerned and cautious. So in these first 100 days of her new administration, I've covered her at speeches, at press conferences, at different things… but this is a different mayor. A mayor that seemed determined to make changes, but is still wary of how she's being perceived and those at City Hall are being perceived. BEVINGTON: So what did the mayor say today about her cabinet? Any more resignations? FOWLER: This is the first 100 days of the administration, which is a typical time for people to leave and to resign. Those that helped get things started may move on to different opportunities. The mayor said it's inappropriate to single any one person out, but everyone she expected to submit resignations did. And she's going to be working with those people to decide who stays who goes and who gets shuffled around a little bit. Basically Rickey, what that means is you're not going to wake up Monday morning and find a brand new cabinet. BEVINGTON: Well that's good to know. A little bit reassuring,, she said there's no timeline on these decisions. In the last week, Stephen there's been several indictments in the ongoing federal bribery probe. Last month's cyberattack on computers is not fully resolved. Did the mayor have updates on those two fronts? FOWLER: Things are pretty mum on the cyberattack front, partly because the FBI and other federal partners have said the less the city says about it the better, because we don't want to continuously expose other vulnerabilities that we may have. And for the bribery probe, Mayor Bottoms says the U.S. attorney is “well equipped” to investigate bribery and corruption, and they are not aware of anyone in City Hall currently that has committed a crime. Once they find out – or if they find out somebody has done it, they will be promptly removed. Now an interesting comment Mayor Bottoms said is that it's impossible to prevent somebody from committing a crime or for wanting to take bribes. But what is possible is for them to better the process to find those out and get those people out of city government as soon as possible.